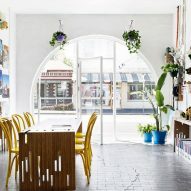 In a bid to improve his mental health and vitamin D levels, architect Andrew Maynard has renovated his Melbourne home and studio to make it so brightly lit that he has to wear sunglasses inside. 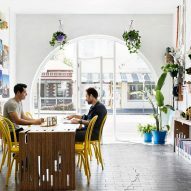 Maynard, the co-founder of Melboure-based Austin Maynard Architects, was prompted to improve his access to vitamin D after his doctor suggested that a lack of natural light was probably exacerbating his work-related anxiety and stress. 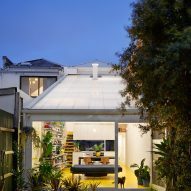 At the time, the architect was both living and working in a 1880s Melbourne terrace house, which was dark with little outside access. He told his wife he was going to overhaul the building with the aim to "wear sunglasses inside". "Most clients ask for more natural light," said Maynard, who named the project My-House (the mental health house). "In my own home I decided to have far too much natural light." "'Lets wear sunglasses inside' I proclaimed to my partner," he continued. "Let's bathe in sunlight and drench ourselves in vitamin D. She thought I was joking." The rear wall of the terrace house was removed and a glazed extension, described as a greenhouse, was added. Glass doors open to the garden, while the roof, which slopes up to meet the top of the two-storey house, is made up of translucent polycarbonate, known as Thermoclick. Inside, the space is occupied by the dining room, with a wall of storage running along one side. The space is dressed with leafy pot plants in an effort to add to the greenhouse aesthetic. A white volume at the back of the space hosts the kitchen and the bathroom, and a utility space for Austin Maynard Architects. 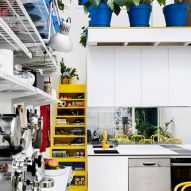 A yellow staircase leads to the lounging platform above, and features storage built into its treads. 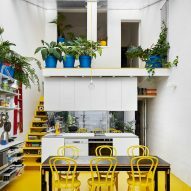 It is one of a series of yellow accents that feature throughout the residence, including the coloured concrete flooring and chairs. 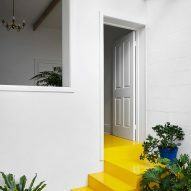 Although adding to the brightness, the architect only chose the colour after asking his Instagram followers for advice. Original features of the existing terrace house, including its high ceilings and small windows, are maintained to offer a contrast to the new light-filled space. 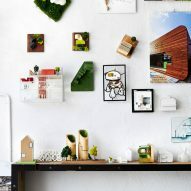 "I aimed to create a dichotomous home," he explained. "The original terrace remains with all of its problems and charms, yet the new extension is a bright, elaborate greenhouse." 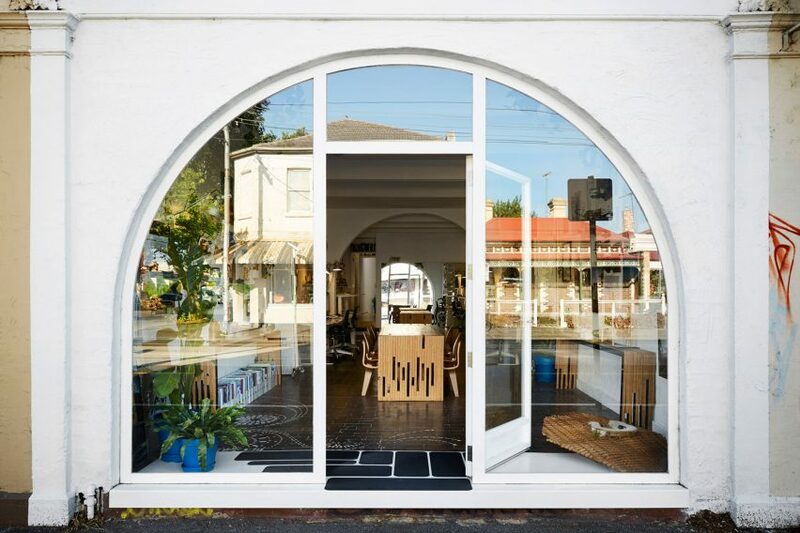 Austin Maynard Architects' office is located in the shopfront ground floor, which features a large window with a curved top facing the street. Maynard and his family reside in the floor above, which includes a lounge and two bedrooms. 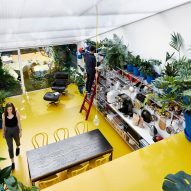 Maynard describes the set up as an experimental way of living and working – his family and his office share the kitchen, living and dining room during the working hours of 9am to 5pm. 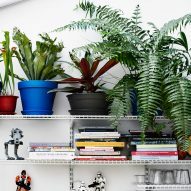 It also offers an example of new ways that people are addressing working environments, as well as a space-saving solutions. But Maynard admits that the design does provide challenges, and it is not as thermally efficient as the residences that he would draw up for his clients. "It is a home that I dare not impose on my clients," said the architect. "It breaks many important rules, often not in a good way." "My-House lets in sunlight where a house should not," he continued. During summer a skylight aids natural ventilation and blue blinds can be drawn over it to offer shade. In the winter, an insulating air gap in the polycarbonate roof and a hydronic heating system work to build heat in the greenhouse, which is radiated to the rest of the residence. 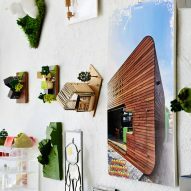 Andrew Maynard founded his architecture studio in the 1990s, and has completed projects including a periscope-shaped extension. He changed the name of the firm in 2015 to reflect the role of Mark Austin, who has been a key member of the team since 2007. Maynard has been vocal about poor working conditions in the architecture profession, and in his 2012 essay Work/Life/Work Balance he addressed problems including overworking. 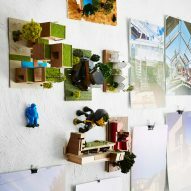 Last year, a survey found that more than a quarter of architecture students in the UK have reported mental health issues related to their studies, with workload and debt among the leading causes. Photography is by Tess Kelly.